Since his debut as MONTERONE in ‘Rigoletto’ at the Malmö Opera in 2004, the Swedish baritone Kosma Ranuer has established himself as a sought-after singer, not least in the Italian repertoire. He appeared as PAOLO ALBIANI in ‘Simon Boccanegra’ at the Frankfurt Opera and in Wiesbaden, SCHAUNARD in ‘La Bohème’ at the Göteborg Opera and MICHELE in Puccini’s ‘Il tabarro’ as well as in the title role in GIANNI SCHICCHI at the Latvian National Opera in Riga. In the spring of 2011 he sang his first JAGO in ‘Otello’ at the Norrlands opera, for which he was nominated‚Singer of the year‘ by the German magazine Opernwelt. Kosma Ranuer sang the role of AXEL OXENSTIERNA in Foroni’s ‘Cristina, Regina di Svezia’, which was broadcasted all over Europe and released on CD (Sterling). In the German repertoire, Kosma Ranuer sang with huge success PIZARRO in ‘Fidelio’ in concerts as well as ALBERICH in ‘Götterdämmerung’ in Riga. His repertoire also includes such roles as BARNABA in ‘La Gioconda’ and MEFISTOFELES in ‘Faust’. In the 2012/2013 season the artist sang his first SCARPIA in ‘Tosca’ on tour with the Malmö Opera andportrayed the title role in DER FLIEGENDE HOLLÄNDER at the Folkoperan Stockholm. 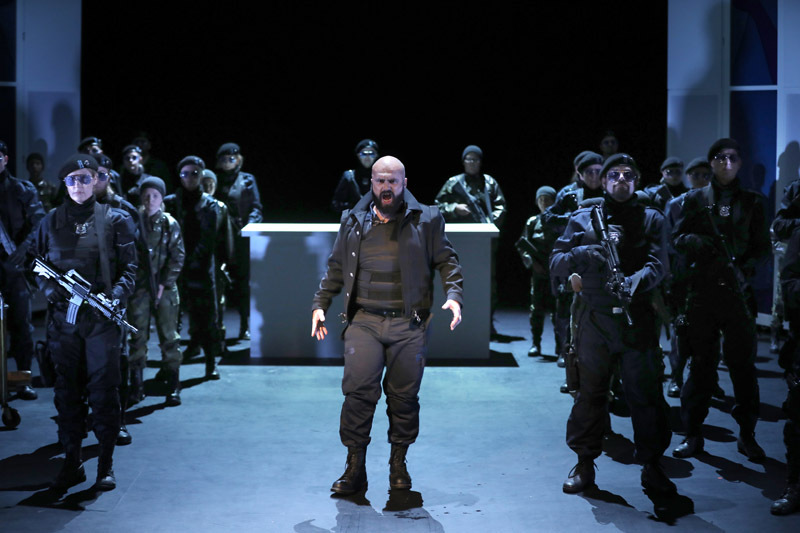 2014 Kosma made his debut at The Royal opera in Stockholm as STANKAR in Verdis ‘Stiffelio’, which were followed by a touring concert for the Norrlands operan on the occasion of their 40th anniversary. In 2015 he returnd a.o. to the National Opera Riga, where he performed the title role of GIANNI SCHICCHI and GUGLIELMO in Puccini’s ‘Le Villi.’ In 2016 he was the ESCAMILLO in Carmen in Stockholm and had a huge success in title role of DER FLIEGENDE HOLLÄNDER at the summer festival at the Ancient Theatre in Plovdiv, the capital of culture 2019. In the season 2016/2017 he could be seen in ‘Rise and Fall of the City of Mahagonny’ at the Norrlandsoperan and as SCARPIA in Puccini soiree at the Rostock Popular Theatre. In 2017/18 he returns to Umea as MEFISTO and to Rostock as KASPAR in ‚Der Freischütz‘ . In summer he will also sing this part at the Chiemgau Music Festival. Among themale actors,, Kosma Ranuer with his richly grounded presence is particularly captivating. …Kosma Ranuer as Kaspar with his well projected, melodious bass baritone voice and his convincing play..
Kosma Ranuer as powerfully contradictive Kaspar. The contradictory and versatile image of the Durtchman was masterly realized by the swedish baritone KOSMA RANUER. With his exceptionally beautiful voice, with depth and brightness and his respectful scenic portrayal.